LTF-414D Full Height Turnstile high security, double model lane, are very secure and very strong means of restricting access. Ideal for large venue applications such as stadia or arenas. Maintains all access operations and integrates the turnstile controls with a wide variety of card readers and other auxiliary systems for reliable access control. For longer service life and higher user satisfaction, it centers the rotor smoothly without any stagger through built-in hydraulic shock absorber mechanism. Long service life with minimum wear and tear thanks to welded monoblock construction that replaces boltsand-nuts. Configurable turn direction overrides the current rotation setting for versatile user-defined access control. Horizontally removable stainless steel top mechanism cover, providing easy service with minimum overhead clearance. Four-armed turnstile design provides minimal room for each user, making piggybacking almost impossible for reliable access control. You can mix and match your full height turnstiles with other turnstile models, like pedestrian security gates for example to allow cargo access. A full height turnstile is a specialized solution. That’s why TANSA maintains a team of knowledgable customer service staff ready to answer all your questions. To make sure that your full height selection fits your installation perfectly and solves your specific access problem, we provide the right consultation and technical specs for your unqualified success. Please check our web site for additional help and resources. 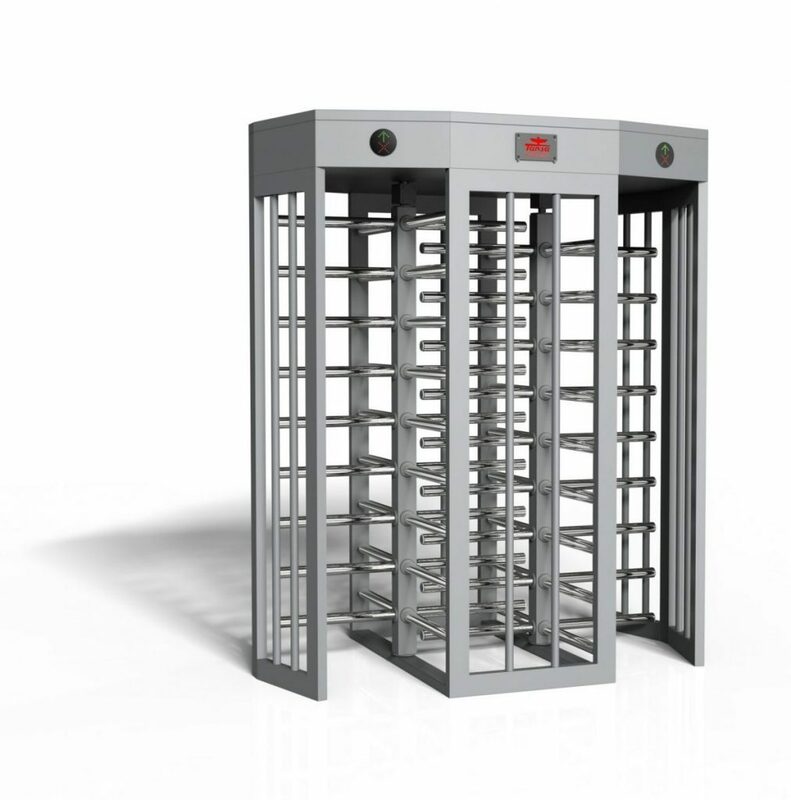 The turnstile is designed to operate reliably in internal and external applications. However, for very dusty or humid environments, it can be delivered with appropriate optional features if the respective specifications are provided at the time of order. The turnstile allows uni- or bi-directional access, either controlled or free. Even when the access is controlled by a card reader, free entry and exit can be configured during specified time periods. This model allow free exit out of the site or the building in case of a power failure, a feature mandated by law. If the customer wants the turnstiles remain locked during such an emergency, such functionality can be provided as an option, contingent upon the written request of the client. However, once set at the factory, the system then cannot be switched back to the emergency-exit state by the client and it remains locked during all subsequent power failures. The turn direction of the system (for entry and exit) are determined by internal sensors. The smooth centering of the turnstile arm after a pass-through is accomplished by a spring mechanism and hydraulic shock absorbers. OPERATION Configurable in both directions, providing both entry and exit with manual push. BODY AISI 304 certified stainless steel (EN 10082-2 Grade 1G/2G). HEAD and ARMS 304 grade stainless steel. Option of painted sheet metal rotor. • Bi-directional access information monitored by electronic microprocessor. MECHANISM Monoblock construction mechanism with control cams that are treated with AISI 304 gradestainless steel. POWER SUPPLY 110 Vac 60 Hz Switch mode supply. Max 50 Watts operational power. Max 24 Vdc internalvoltage. ENVIRONMENTAL SPECS -4 / +122 F° /(-20 / +50 C° ) temperature range. Can operate even in -40 F° (-40 C°) withthermostat-equipped optional external heater. Rated for Max 95% humidity. EMERGENCY MODE In power failures or when an emergency signal is issued, the rotor and theturnstile arms turn freely without any resistance to allow free access. We provide a wide range of models which are available with different finishes and options to serve your needs. Please consult our web site for the available options. TANSA enjoys quality certifications such as the ISO 9001. It maintains a sale and support office in Rockville, Maryland, USA for all its customers in Northern America. TANSA is not a large corporation; it is a family company of people that are hardworking, productive, and responsive to our clients. In fact we thrive being an integral part of your team. Engineers and designers of TANSA are able to provide specific turnstile solutions tailored to your CAD projects, around the clock. Our highly efficient manufacturing capabilities allows us to provide you with considerable savings when compared with other brands.